Warning: if you are bored of me blabbing about chickens, skip this post! But I have been doing the normal things that life demands. 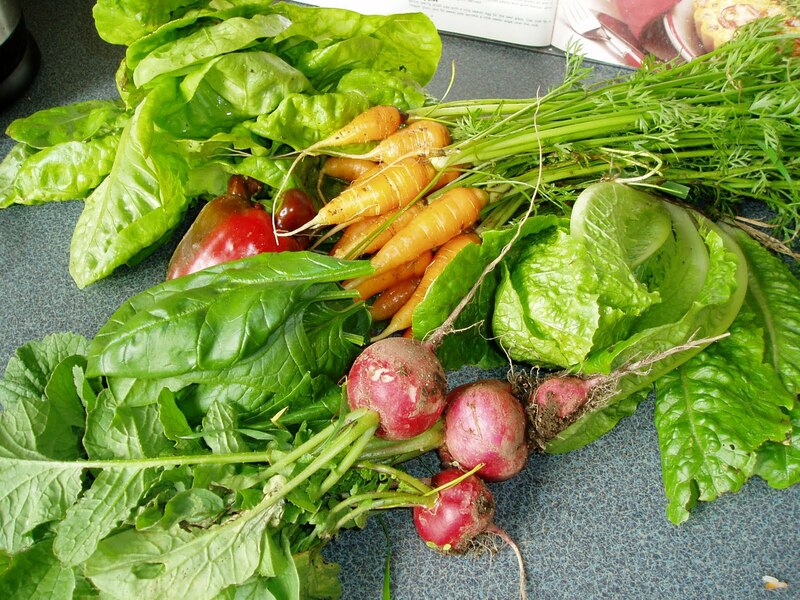 Like harvesting veges - and then artfully arranging them instead of cooking with them, which is what I should have been doing! 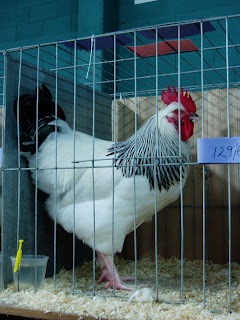 And I got down to Whangarei for the Annual Poultry Show. I never thought about the noise factor. 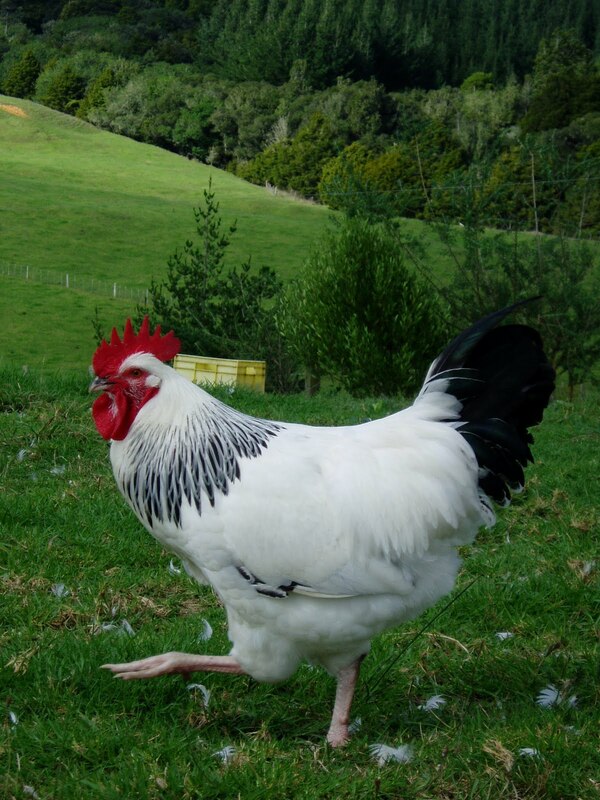 Roosters crow whether they are out in a paddock or cooped up on display! This is a Barred Plymouth Rock. A wee boy said he was his favourite and asked me to take a picture of him, so I obliged. What a sweetie! 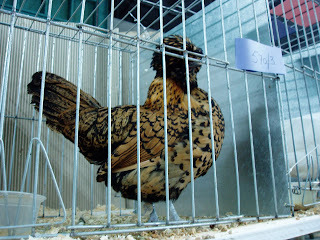 There were some beautiful birds. 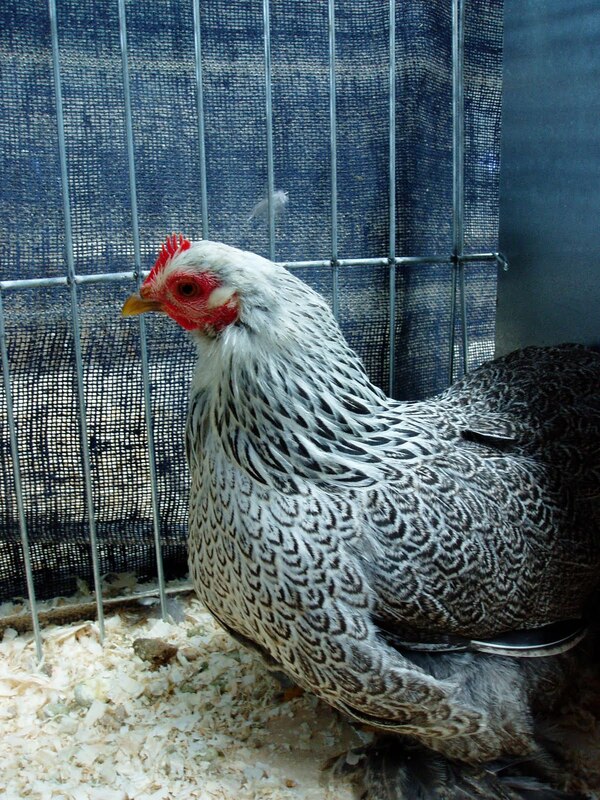 An, ummm, silver-pencilled something or rather pekin - stunning! 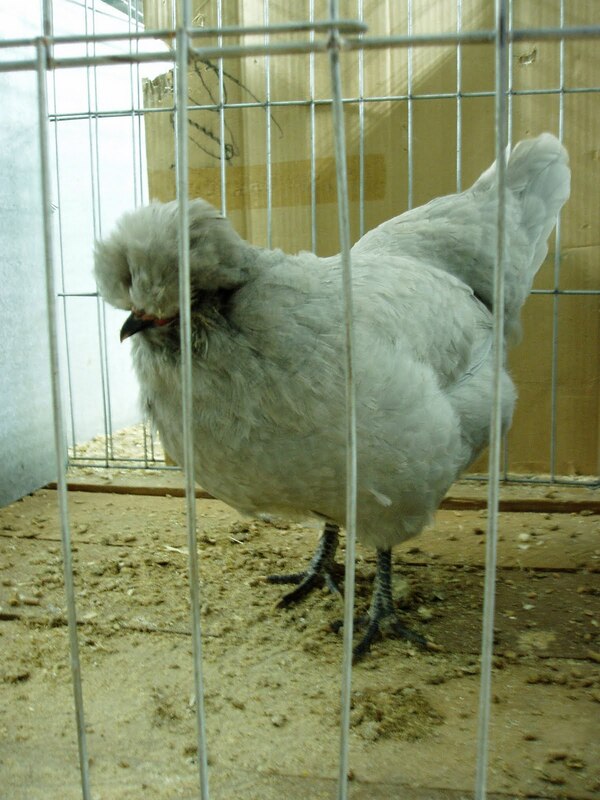 Lavender araucana pullet. They lay blue eggs. I have five lovely girls - but do you think I can find a well-bred boy? Nope. 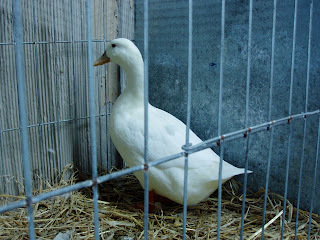 The lone Pekin duck. 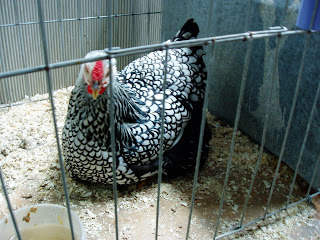 Teeny tiny compared to mine - I think there are UK pekin and USA pekin - but don't quote me on that, and I wouldn't have a clue which mine are but I should have entered - I might have come home with some awards. I'm definitely going to enter something next year - now that I've actually been to a show, it's actually not that scary! And I'll leave you with this. It was the sunrise this morning. It's nice to admire the view every now and then. I need to show a little bit of gratitude. 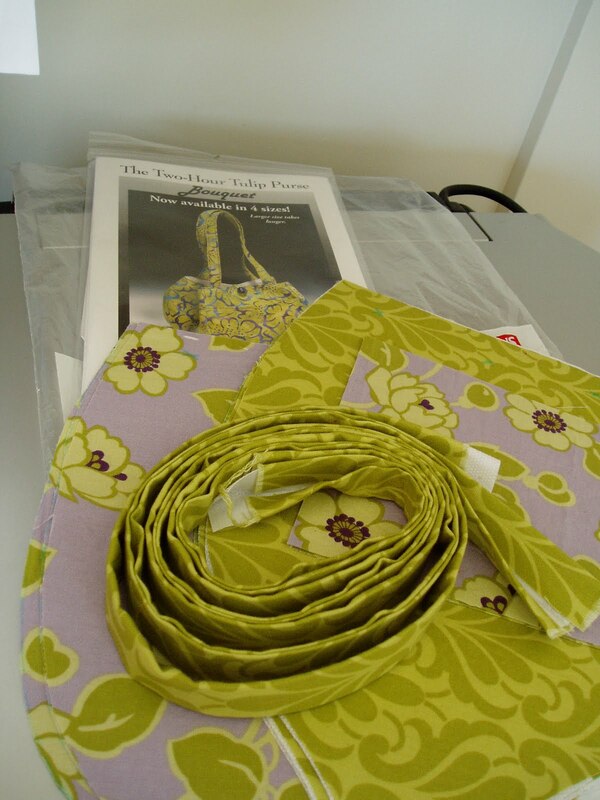 And lastly to Wright Fabrics. 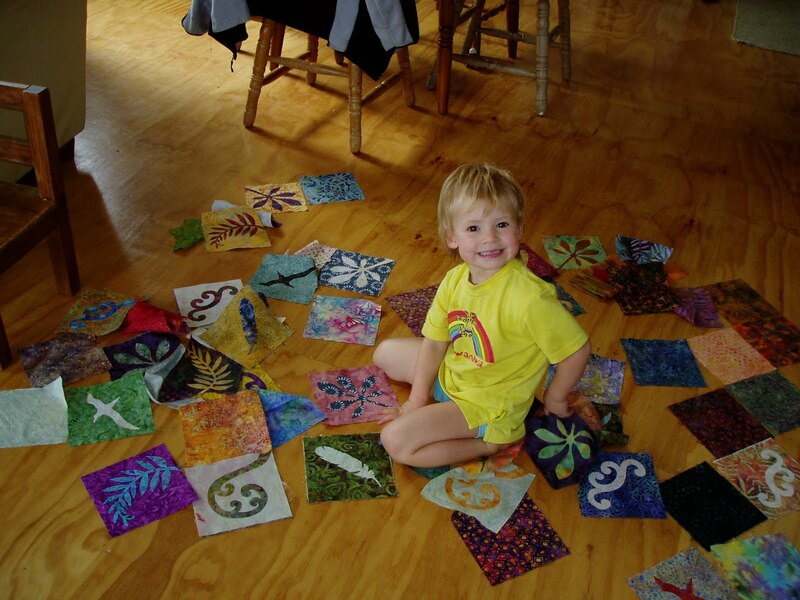 They sell good quality, reasonably priced batiks over their website. I did an order (I treat myself occasionally) and although my payment went through, no fabric arrived. Usually they are fantastically fast so this was unusual (okay, the sounds like I order more often than occasionally). Anyway, when I called them, they had had the payment but no order had come through. And glitches happen, so I wasn't expecting it, but they sent me a half meter of fabric added to my parcel as an 'opps, sorry'. Aww, the world is full of good people. Virtual hugs to them all! 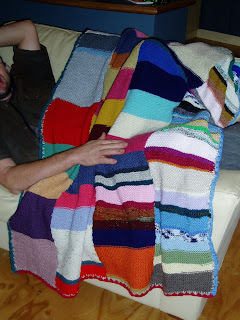 I thought I'd write a bit about using woollen blankets as batting for my quilts. I've had a few comments on it and a couple of questions so I guess there is interest, right? I love old woollen blankets for so many reasons. Natural fibres have something going for them, very warm, breathable, they break down easily - the worms in your worm farm will love your wool scraps! Then there is the history aspect (I mean who hasn't heard a New Zealand orientated sheep joke, right?). The label on the top blanket is a very well-known historical brand name, lots of people grew up with Kaiapoi blankets on their beds. And of course; reduce, reuse, recycle. To buy new batting isn't cheap, especially if you make big quilts. I've picked up most of my blankets for between $5 and $12 NZ dollars. And most of them are in great nick. 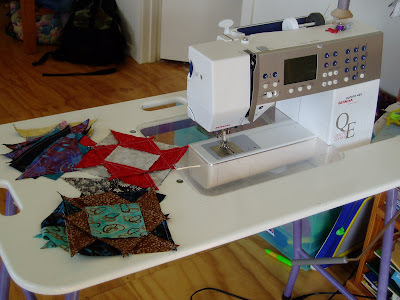 Even ones with a few thin spots and holes can be sliced up and used in bassinet quilts and cot quilts. This is all that is left of this blanket. It had some holes in it when I bought it, but it's given me a big patch for a friends woollen blanket quilt I repaired, batting for a cot sized quilt, a thin and holey section for the cat's basket ;) and I've still got enough to make a couple of bassinet quilts. Second hand or preloved blankets have usually been washed so many times that all their shrinking and felting is done, but I recommend to quilt recipients that they gentle machine wash on cold, or hand wash - but I'd recommend that for any quilt anyway. This is one of the first quilts I made using a woollen blanket for batting. 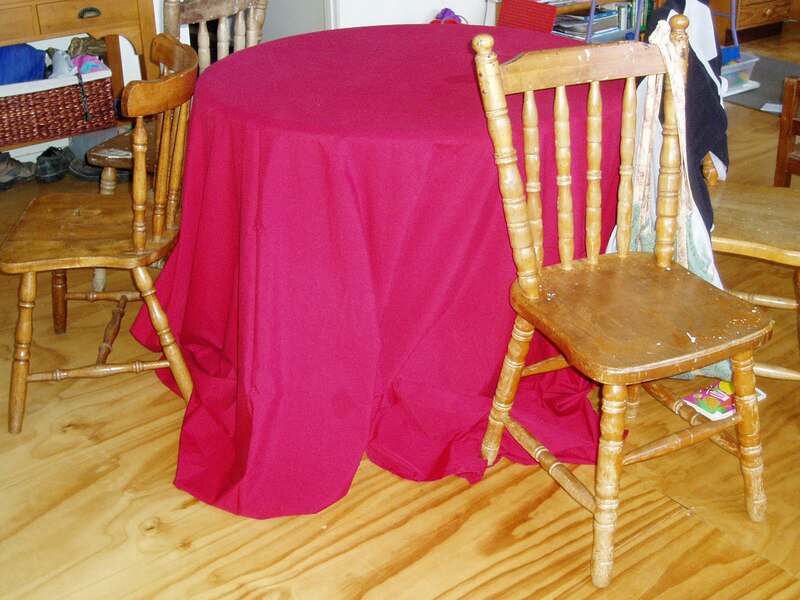 These photos are to give you an idea of the loft of a blanket as batting. (The black is the back). You can see that there is scarcely any bearding, which can be an issue with polyesters and I think it gives a slightly flatter look, but still shows up the quilting just fine. It's a queen size topper and, if I remember correctly, I had to join two blankets together. 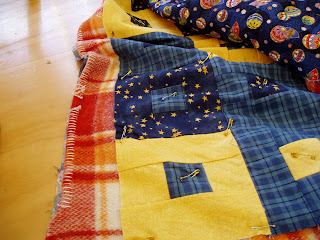 For joining, cut off any edge binding to reduce bulk, then layer your blankets so there is an overlap of an inch or two. Large zigzag stitch down each overlapped edge and you're done. This gives a flatter finish, much less noticeable than a traditional seam. 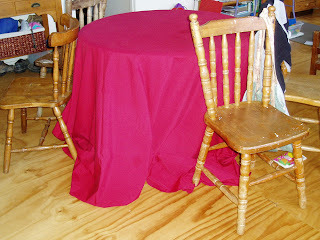 If you have a really nice blanket you can use that as a batting and backing - just don't cover it up with a backing fabric! So, go ahead and try it. And then when you are finished - enjoy snuggling under your quilt knowing how much good you've done the world, and how much history you are snuggling under. 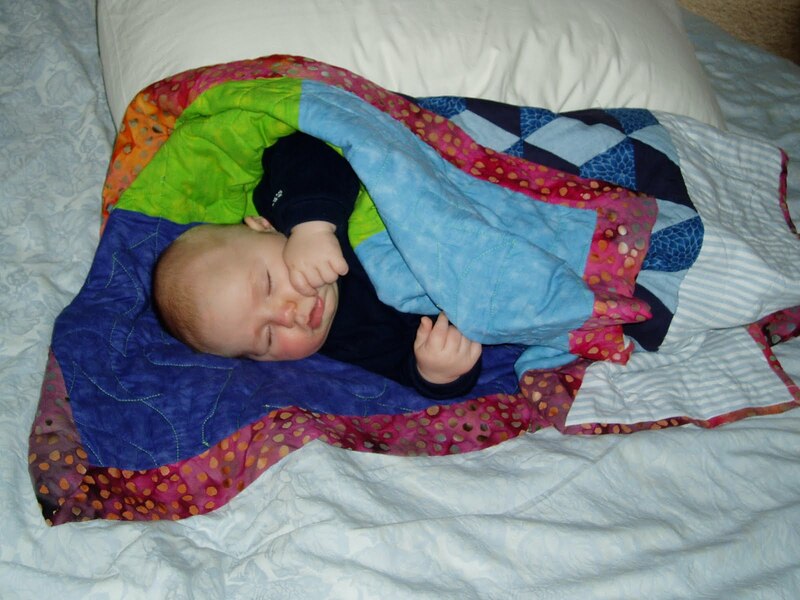 This is the first ever quilt I made with my boy, now five years old, rolled up asleep in it. 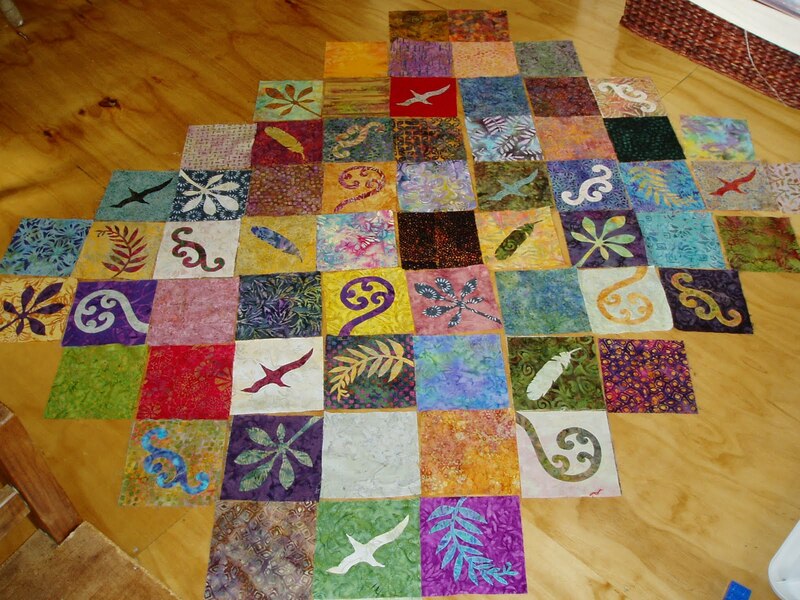 It took me years to finish it, it's half hand-pieced as I didn't own a sewing machine when I began and it started me on my woollen blanket journey. I batted it with one because I had nothing else! 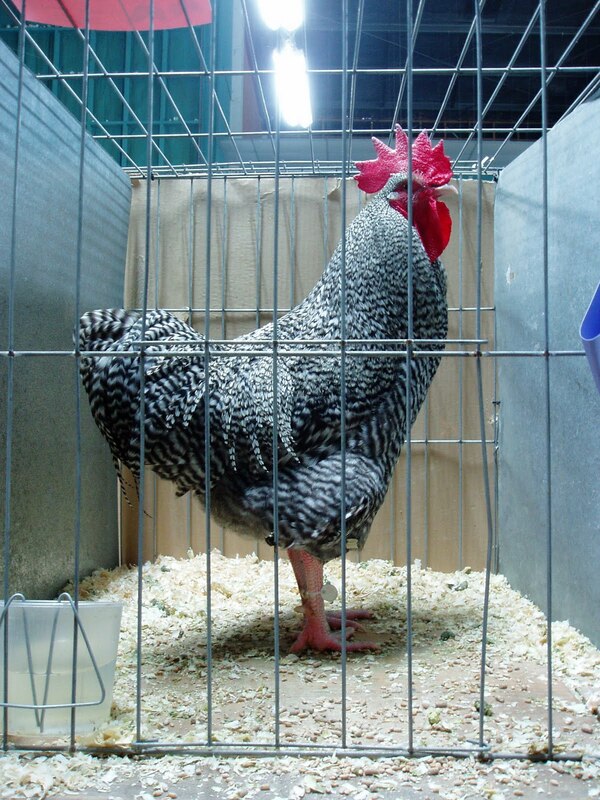 I mean, if I were a hen, I'd want him for my rooster - wouldn't you? 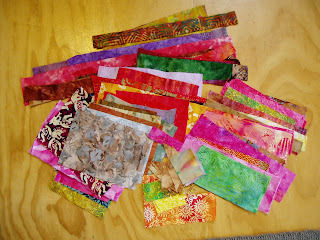 As for Work-In-Progress Wednesday...well, I have lots of little piles of sewing, all waiting for my machine to come back. She's still off on her adventure. Lots of little batik half-square triangles left over from snowball blocks I made for another quilt ages ago. 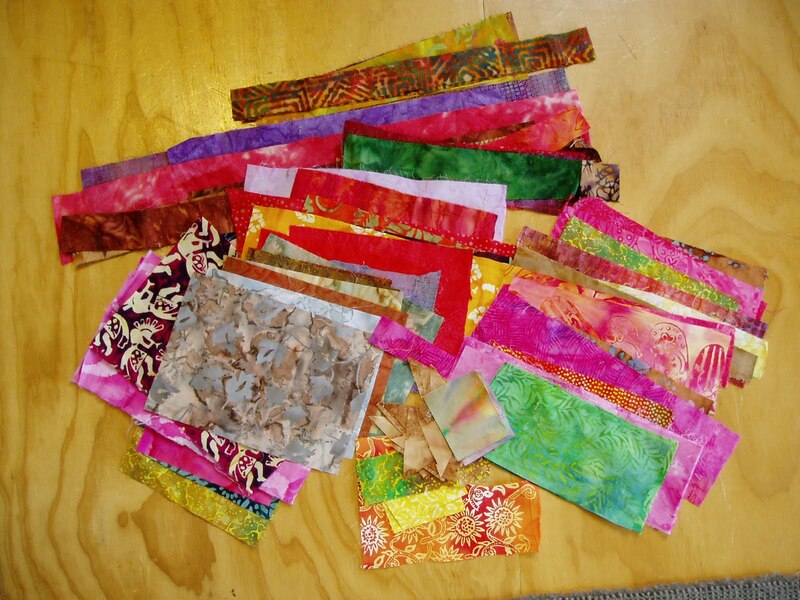 I thought I'd sew them together into a cushion cover or something. 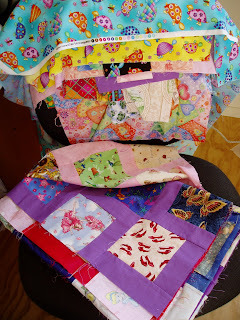 I'm making an I spy quilt for my daughter (you have to make one of them in a lifetime don't you?!). I discovered what to do with all the leftovers of the prints - make the backing! So they are patiently waiting to be pieced in some fashion or another. 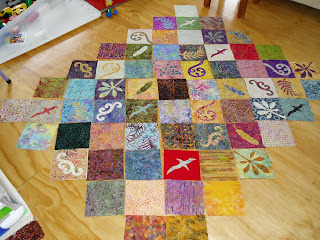 Can't show too much of this one as the intended recipient's parents read this blog ;) It's waiting to be quilted. You can see the old blanket I've used as batting. And a bag, just for me, just for fun. Soggy Bottom Flats (don't you love that name?) is doing a giveaway over on her blog. 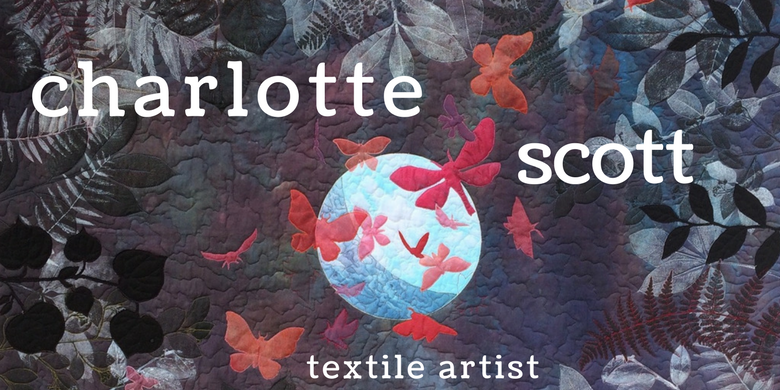 It's a kit for wool applique and if you've never tried wool before, now might be a chance to do it. 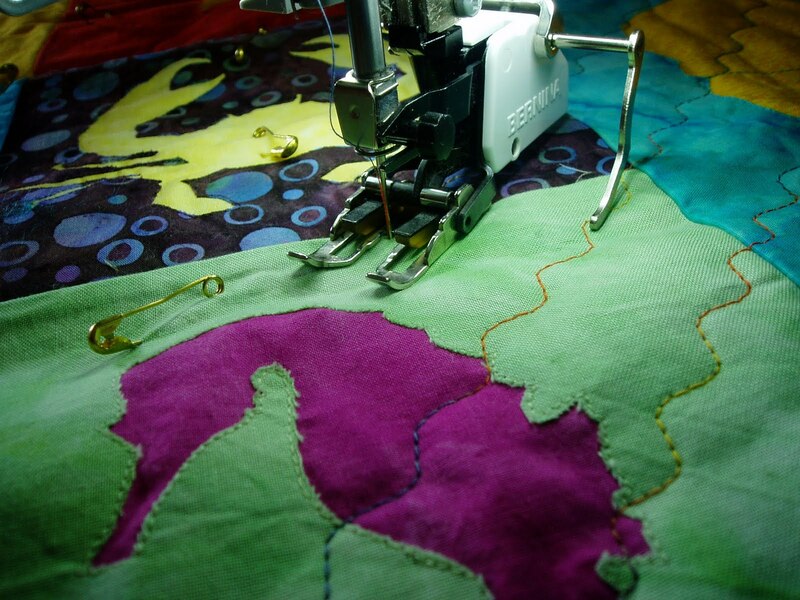 I've never really worked with wool in applique. I tend to use my old blankets as batting for quilts, especially small ones for children, as I don't like using polyester for kids and because the quilt is small, it doesn't get too heavy. But seeing some of the lovely wool work that Elaine does, I might just have to give wool a try! 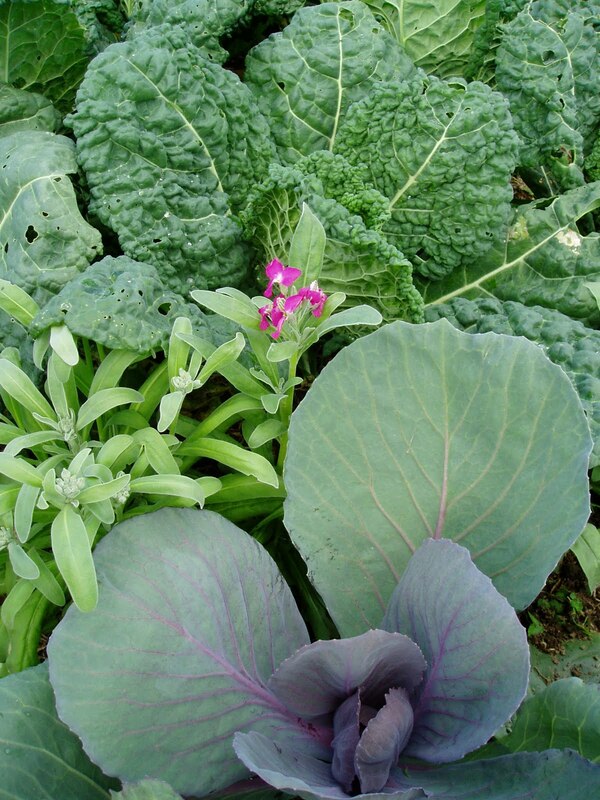 How cool is this colour and texture combination from my garden today? My Sunday's seem to be very productive of late. Saturday's are duck shooting days for Hubby so they are just me and the kids and it's hard to get anything done - I don't bother trying, really. But Sunday's! Today I had a few hours to myself in the middle of the day when Hubby took the kids out, he needed to buy some new trousers. But even before he'd gone, just having two adults around means that it's not always me that has to sort out the kids. 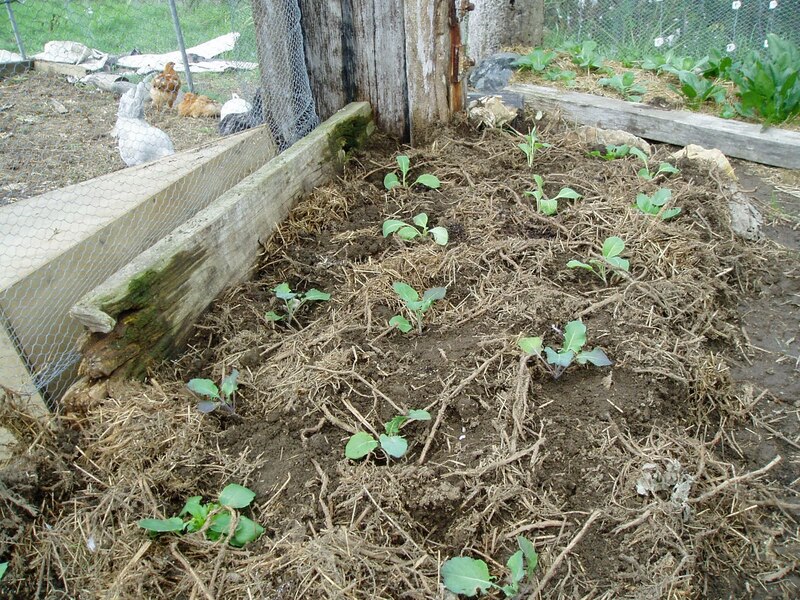 So I got stuck in and turned over a vege bed and planted more broccoli and cauliflower interspersed with pansies (aren't they the cutest flower ever?). I shifted the rooster house in the rooster pen that was shading my vege garden as the sun lowers it's arc in the sky. 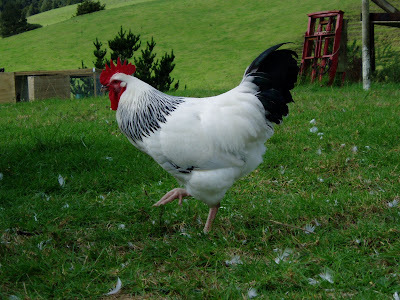 Heavy, but Hubby was busy shooting pesky, chook-food-eating sparrows for me. The wee rabbits are seven weeks old now so I separated mummy bunnies from babies and penned the babies separately into female and male pens. Cute, but feisty, and I have scratches all over my belly. I planted my first tree of the season (only about 699 to go, but luckily they haven't all arrived yet). 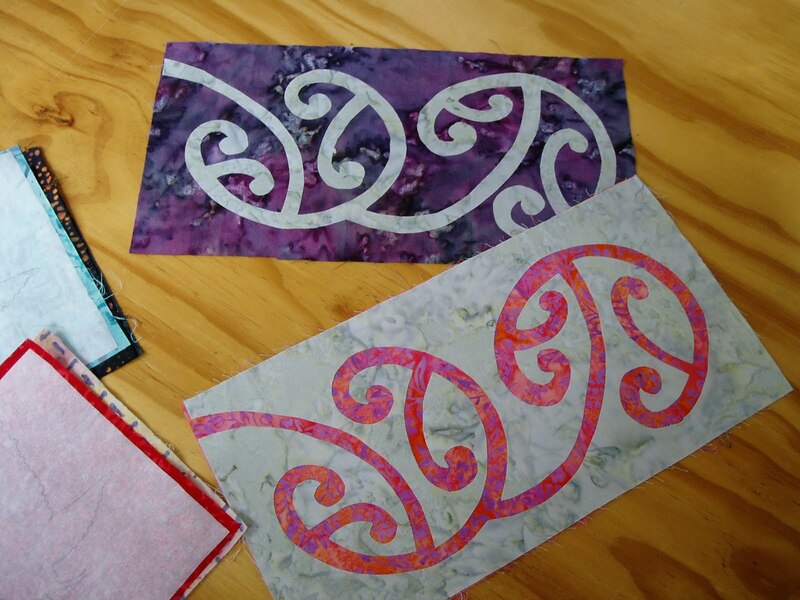 And I had several cups of tea in silence and did some more cutting and bonding for my mother-in-law's quilt. I hung out washing, I even vacuumed! Later when the kidlets and Hubby got home, we took the trailer down to our secret roadside quarry and got another trailer load of rocks and I unloaded them all and built a garden edge with them. And now I'll sleep well and look forward to tomorrow. Hope you sleep well too. Cubbys on a rainy Saturday. There is a grumpy sad boy in there. 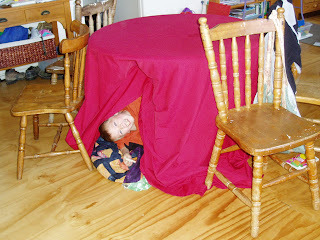 But a cubby does wonders for kids. Their own space. Somewhere to contemplate the world, close to the family, but separate too. Privacy. Food does wonders for small sad boys too. I slid an order of crackers, feijoas and a carrot under the sheet to the cubbyhole monster. And minutes later I had a happy, playing boy. I don't think food is going to help me. What I'm longing for is a weekend away. Alone - that is - without children. Much as I love my little devils darlings, I so need some time without them to recharge. So I'm planning, and soon, soon, soon I'll be sewing and drawing and reading and walking and sitting staring at the wall if I want to, for three or four days. It's raining outside and a howling gale. It blew my rooster pen gate (a sheet of corrugated iron with a slab of wood against it - sophisticated, I know) open and four of them got out and are literally blowing around the lawn. 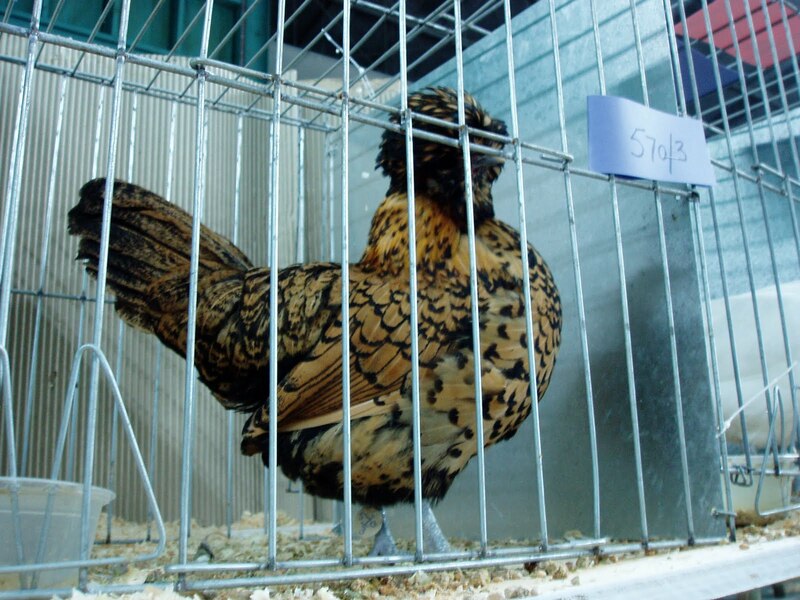 Hopefully they'll have had enough by this evening and be happy to go back into the pen! Perfect weather for staying inside and quilting. Except I still don't have a machine. The service man rang me yesterday and she has to be sent away for a new electricky-sockety-board-plug-thingey and, of course, she is three months out of her electrical warranty. So I'm sifting through my projects and working on bits that don't need sewing. I don't have a design wall so I lay my quilts out on the floor. I needed to lay out this one to see how big it's getting, how many more blocks I need to do, how the colours are working - basically an overall critique. I take photos because it gets me further away from it and picks up things I don't see with the naked eye. Like the red albatross - stands out like a sore thumb! Ah well, they say never work with animals or children! Little Miss Mischievous! Now for all you quilters out there, if you haven't done it in a while, go put a new blade in your rotary cutter. It's absolute bliss! Water, water everywhere, and lots and lots to drink. Well the drought has well and truly broken. We've had three days of rain. 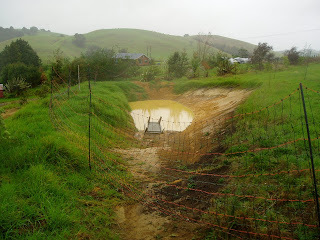 My 25 000 litre water tank is overflowing and our dam is finally filling. Which brings us to an urgent problem. The dam needs fencing. I guess it's not really a dam as we haven't dammed anything except a swale. It's more a waterhole. 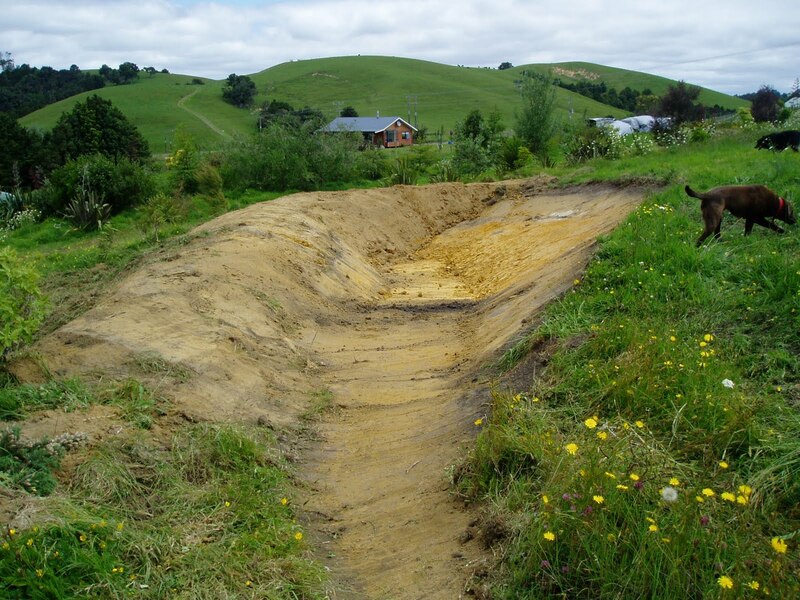 But whatever it is, when it's full it will be well over my five-year-old's head and a perfect drowning hole, being only about 30 metres from the house. 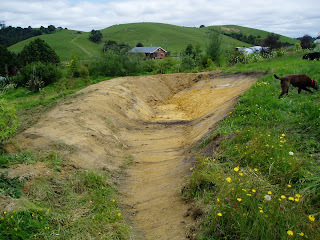 November 2009 when the waterhole was dug and now, May 2010, it's finally filling. 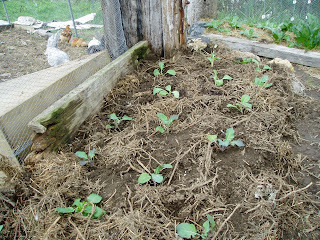 I have lots of planting to do around it. 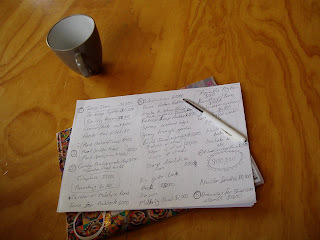 So, Hubby and I decided to sit down and do a budget and priority list. You either love budgets or hate them - I hate the stark reality of them, but I do appreciate their necessity. We listed everything we want to do out here in the immediate future (bar building the house - we would have to borrow big time for that and so far we're enjoying the shed that much, who needs a house?!) and then an estimated cost next to each one. Gulp. The grand total: $100,000. We have a little bit of money put aside in the bank from when I was working, we've committed ourselves to some projects already and some are must-do's and by the time we'd married all this together we knew exactly what we can afford to do over the few months. And it certainly wasn't the whole list! It looks like I won't be getting a milking shed or a movable pig house, or a deck or a new car. But we will have the subdivision completed, safe children and lots of trees planted. Terrible pic, I know. But I couldn't wait till the morning to get a good shot of it. Mmmmm, most of the squares feel like wool and it fabulously warm, just in time as the evenings have a definite nip about them. Perfect for snuggling up and reading my book. I just have to steal it back from Hubby. I was going to show you my work in progress for Wednesday. I was.....until my sewing machine broke down. I guess you can still see my bits and pieces, all lined up waiting to be joined into blocks, but I wanted to show you the blocks NOT the bits and pieces. Maybe she is trying to tell me something. Have I been neglecting her? Have I not been using her enough? Is it that she still doesn't have a name after ummmm four years? Anyway, she made a high pitched squealing noise and turned herself on and off and on and off. I fiddled with her plug, it got worse. I tried to sew anyway (you know: ignore it and it will go away), it got worse. Her screen went blank, I got scared so I turned her off for good and off she goes to the shop. She just wanted a holiday! I've been absent for a few days. I got lost. I do that occasionally. Lost in a book. I will read and read and read and read and take the book to the laundry with me and try and fill the washing machine one handed. Now I don't profess to be a book critic. I don't belong to a book club and I don't spend time analysing the themes etc. (Hey, I don't have time to analyse themes - I'm READING!). But this book grabbed me - not immediately - but in the end, so thoroughly, that I stayed up to midnight last night finishing it. I don't like to recommend books to anyone - tastes differ so much. 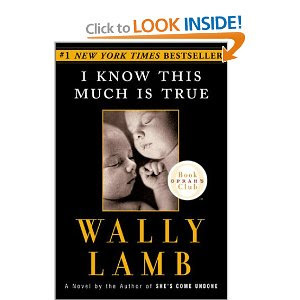 But if you're going on a long holiday (it's about 900 pages odd), maybe pack this one. I've also been thinking about some remodelling - a blogovation if you like. 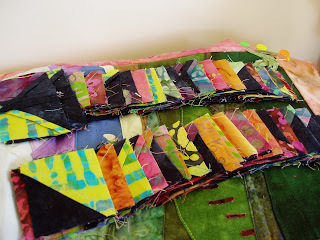 Back when I started this blog I called it "The Slightly Mad Quilt Lady" for no better reason than it popped into my head (it might have something to do with all the night shifts I was doing). 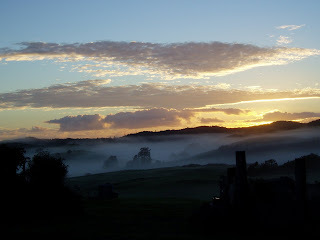 But I've found out I can change the name, and seeing as this blog's content is about 80% Windyhill Farm life and 10% Quilting and 10% Rabbiting On, I thought maybe I should change the name. What do you think? Plus I'm not really Slightly Mad.